Chris Newsome took this picture of Saturn next to the Beehive Cluster at 23:45 UT on the 25th January 2006, two days before the planet reached opposition. Saturn is the bright object to the lower right of the cluster in the 4 o'clock position. The image also captures the star BY Cancri about 5 hours after it had undergone an occultation by Saturn, visible from the UK, at around 19:00hrs on the 25th January 2006. Three of Saturn's moons are also visible very close to the planet, and these, BY Cancri and another field star are identified on the magnified insert at lower left. 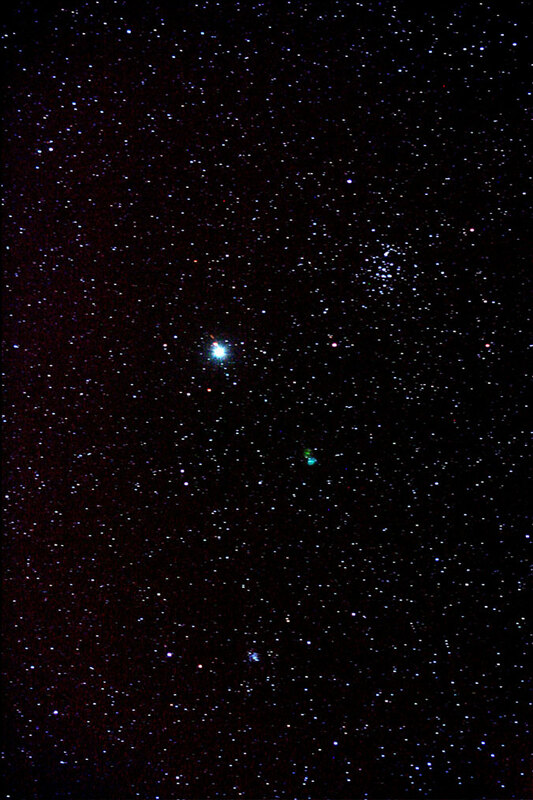 Chris used a Canon EOS300D camera and a Skywatcher 80T refractor. He took four 60 second frames at 1600ASA and combined them in Maxim DL. These were processed in Photoshop CS2 and using various dodging techniques, Chris processed the area around Saturn to reveal the moons. Further processing used RGB Levels, curves and GradientXTerminator. Saturn shines brightly near the Beehive Cluster in this image by Chris Newsome taken around 05:00 UT on the 7th December 2005. The image was taken with a Canon EOS300D camera piggybacked to a driven Celestron C6-N and fitted with a Skyglow filter. The image is comprised of five 180 second frames at 800ASA which were stacked in Maxim DL and then processed in CS2. 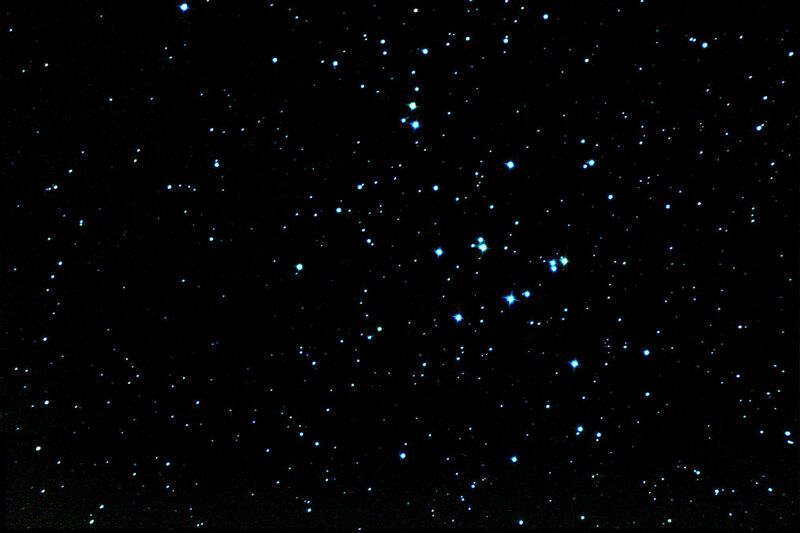 The open cluster M67 lies near the bottom of the picture, directly below Saturn. 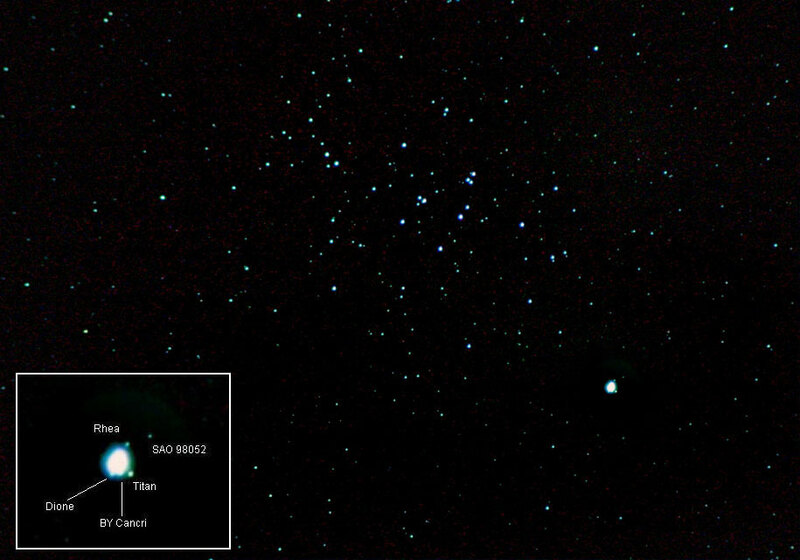 The following image of M44 was taken by Chris Newsome at around 04:30 UT on the 7th December 2005. It is a combination of five 60 second images stacked in MaximDL and dark subtracted with 12 dark frames. The images were taken with a Canon EOS300D at the prime focus of a Celestron C6-N. The processing, using GradientXTerminator, curves and RGB Levels was carried out in CS2. 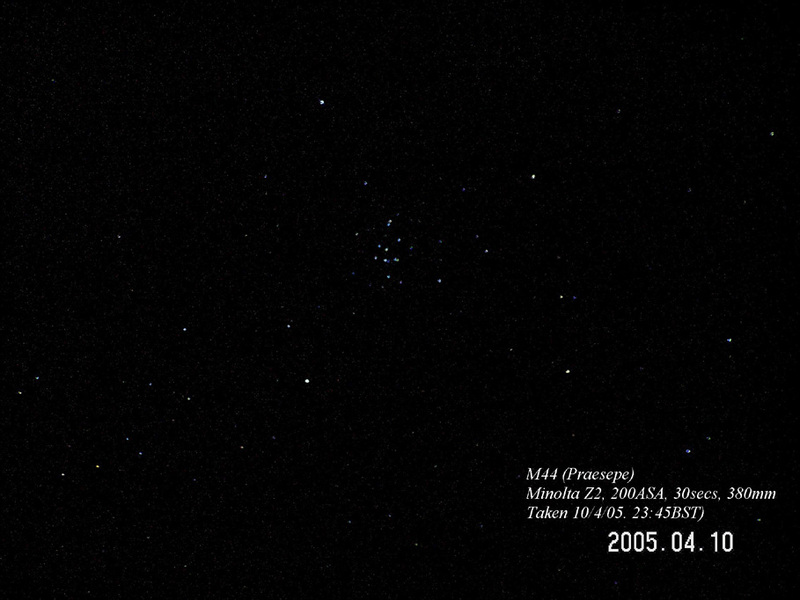 Chris Newsome took the following image of the open cluster Praesepe (M44) in Cancer on the 10th April 2005. He used a Minolta Z2 digital camera at 200 ASA and a 30 second exposure.